Charity Navigator: Charity Navigator Turns 16! 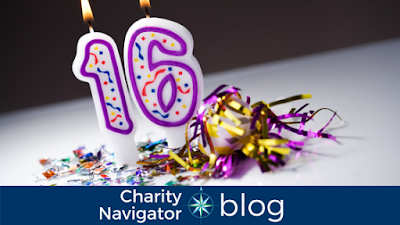 Over the weekend Charity Navigator turned 16! Can you believe it? We’ve been providing donors with unbiased charity ratings, tips, and resources since 2002. A few weeks ago we shared the story of Charity Navigator’s beginnings. Today, we’re going to look at where we’re going. Last year, Charity Navigator went through a strategic visioning process to define our path forward for the next five years. As part of that process, we adopted new mission and vision statements. These statements are calls to action and reminders for the Charity Navigator team that we work behind the scenes to help donors everywhere be more confident, impactful givers. We believe that philanthropy is not a privilege reserved for a special group of individuals, rather all people have the power to change the world through their giving. Make impactful philanthropy easier for all. A world where philanthropy is inclusive, vibrant, and effective. In addition to our new mission and vision statements, Charity Navigator defined and adopted three goals for moving forward over the next five years. We aim to become an increasingly valuable resource for our users, as well as the charities we evaluate. Equip. Equip the entire philanthropic ecosystem with the tools, ratings, and information they need to make impactful investments. Expand. Expand the number of people and organizations who understand and commit to the idea of intentional philanthropy. Deepen. Stimulate a deeper commitment to giving. Head over to Charity Navigator to learn more about these goals, our mission and vision statements, and our operating principles.